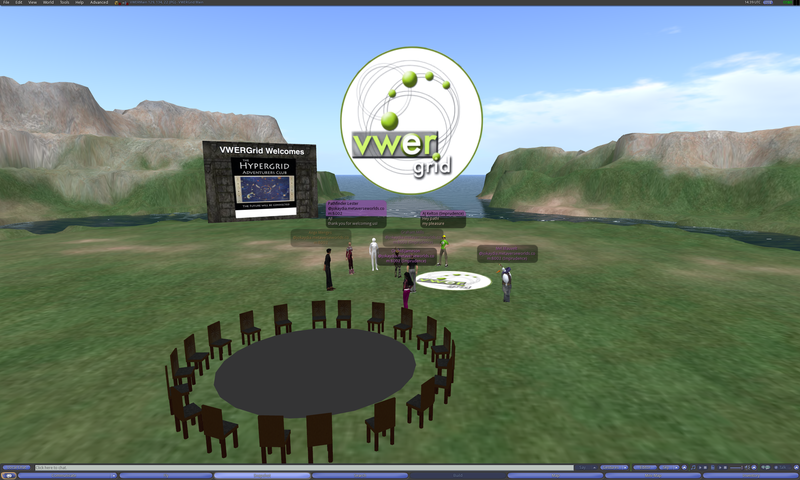 For today’s meeting, we visited VWERGrid, the new home of the Virtual Worlds Education Roundtable community. On November 11th, 2010, the Virtual Worlds Education Roundtable announced the opening of their second virtual home on their own Opensim grid called VWERGrid. Today we traveled to VWERGrid and had a chance to speak with AJ Kelton, the founder of the VWER. The Virtual Worlds Education Roundtable (VWER) has maintained a very active presence in Second Life since March of 2008. The group hosts public meetings every week with a very strong collaborative community of educators and researchers. The meetings feature guest speakers and roundtable discussions about the future of virtual worlds in education, and full transcripts are available in the archives on their website. Pathfinder Lester: Mike, what intermediate place did you hop to first before coming to jokaydiagrid? Pathfinder Lester: i’ll wait a bit longer before we officially start. Pathfinder Lester: we’ll probably have a smaller group today because of the holidays, i suspect. Ange Menges: During this time can I explain you something, Path ? Pathfinder Lester: Ange, please do! Ange Menges: I’ve already talked about the french group explor3d who wants to organize hypergrid trips. Ange Menges: This is a group that meets in real life to discuss all internet and new technologies uses . Virtual worlds are only a part of their interests. 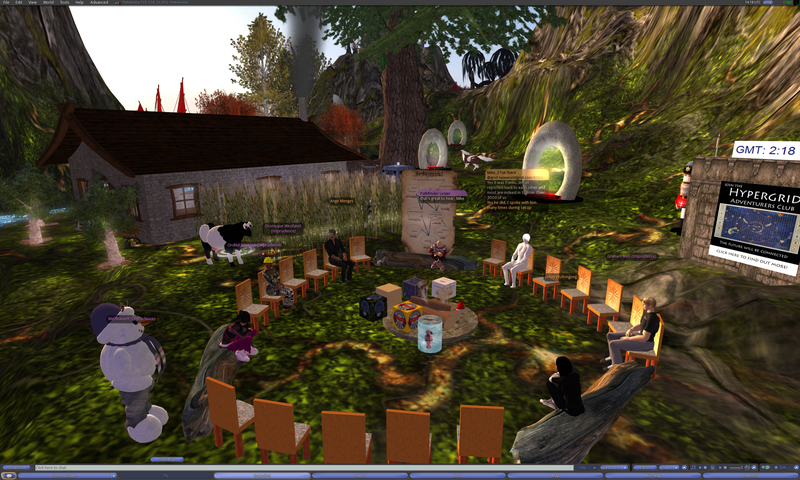 Ange Menges: The name of the responsible for the virtual worlds part is Enora Gregan on second life and opensim . She is Cattleg on twitter. Pathfinder Lester: Ange, that’s wonderful to hear. Ange Menges: For now they were only interested in second life. I now hosts them on one of the regions of my server in francogrid. Ange Menges: Their first meeting on opensim will take place this evening at 20GMT. Ange Menges: Most of them are not accustomed to the use of viewers so that it will be primarily a training meeting. Ange Menges: I will try to arrange a meeting first with Pathfinder to see if it is possible to consider travel together or develop other projects . I will also try to get Enora to one of the meetings of HGAC. She is very interested but was not able to make during our meeting hours for now. Pathfinder Lester: thank you so much Ange! Pathfinder Lester: i can’t wait to meet them. i am not sure if i can come to the meeting today, but i will try. Pathfinder Lester: grab a copy before it melts! Pathfinder Lester: Mike, this is your first time here. Welcome! Oronoque Westland: I’m Roberta Kilkenny in the physical world. I teach at Hunter College in New York. Interested in immersive environments for learning. Pathfinder Lester: Mike, so you originally used There.com? Pathfinder Lester: I remember you told me you now have a presence on NewWorldGrid and also jokaydiagrid. Pathfinder Lester: i remember when There closed. very sad. but it’s good to hear folks from that community are still around and exploring new worlds. Oronoque Westland: @Mike, what is there.com please? Pathfinder Lester: i remember the dune buggies and hoverboards. they worked really well, physics-wise. Pathfinder Lester: I was working at LL when There.com closed. i remember many of the folks coming to SL and trying to settle. 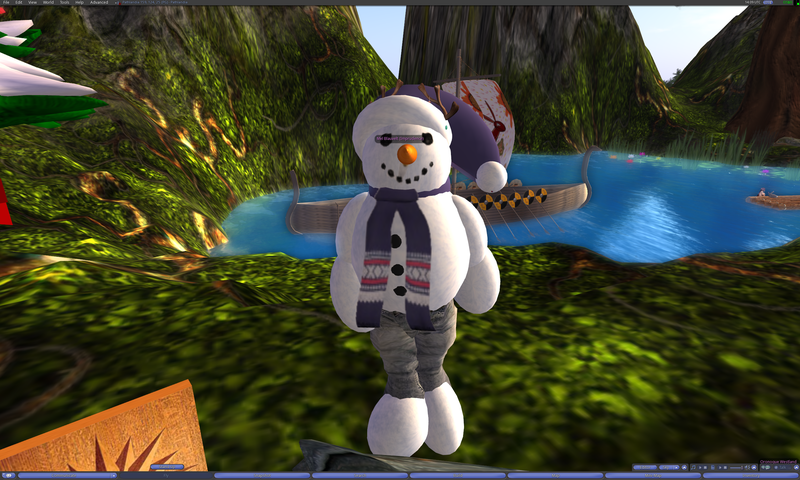 Pathfinder Lester: Blue Linden worked with many of those folks when they arrived. built a special area to welcome them. Pathfinder Lester: Mike, what’s your region’s name here on jokaydiagrid again? Pathfinder Lester: Graham, yeah, i’ve noticed that happening too. working out some kinks. Pathfinder Lester: it’s a group that started in SL 2 years ago. they meet every week to discuss education work in virtual worlds. they also have guest speakers and presentation. Pathfinder Lester: Graham, me too. i sometimes write for their blog now, too. Mike_37uk There: Unversity of Leicester Oronoque? We’ll be making this jump using one of the instant Hypergates on Pathlandia. It’s the stone archway next to the statue of the woman holding the bow. Be wary of the kraken nearby on the coast. Just walk up to the archway and walk through it. You will automatically make a Hypergrid jump to “VWERMain” on VWERGrid. 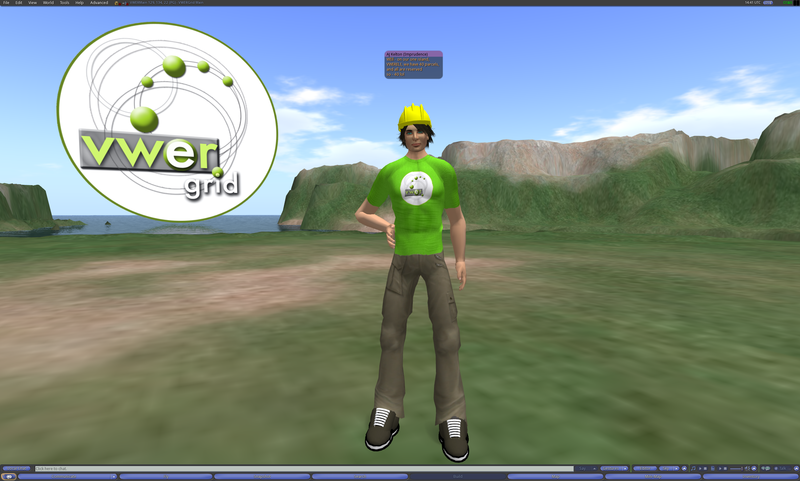 On November 11th, 2010, the Virtual Worlds Education Roundtable announced the opening of their second virtual home on their own grid called the VWERGrid. For more information, see http://vwer.org. Pathfinder Lester: i’ve updated all my blamgates here on Pathlandia so they all now give out a notecard explaining how they work when you touch the gates. Pathfinder Lester: have you been trying to set them up? Oronoque Westland: you are referring to the stone portals, correct? Orchid Jameson: so our backup is address on notecard..? Pathfinder Lester: i always include the hypergrid address in the notecard even if we’re using a blamgate. as a backup in case you want to make a manual jump. Orchid Jameson: I have an open IRC window too..
Pathfinder Lester: ok, we can head over to the VWERGrid blamgate now and try jumping! Pathfinder Lester: i’m standing next to the gate now. it’s across the water up the mountain a bit. Our group walks through an Instant Hypergate (aka Blamgate) on the region Pathlandia on jokaydiaGRID. And we arrive on the region VWERMain on VWERGrid. Pathfinder Lester: thank you for welcoming us! Pathfinder Lester: AJ, how many different folks have you set up with parcels here already? Pathfinder Lester: it’s great you’re helping them dip their toes in here for the first time. Pathfinder Lester: this is how frontiers grow. exactly like this. Pathfinder Lester: he’s gentle. just don’t make sudden moves. Ange Menges: lol, really nice one ! Pathfinder Lester: i think it’s something to do with how hypergrid is enabled on the region, maybe? AJ Kelton: can anyone else see it? Pathfinder Lester: told them they could leave things for folks here if they wished. Pathfinder Lester: Also, i’ve installed a permanent blamgate on Pathlandia that takes you right here. Pathfinder Lester: it’s the blamgate we used to get here today. AJ Kelton: Well – good afternoon to you! AJ Kelton: does anyone mind my using a picure of us on our vwer.org web site? Pathfinder Lester: be my guest! Orchid Jameson: bye for now..
Pathfinder Lester: take care, all. bye! Note: At the time of this blog post, there are still some glitches with hypergrid visitors traveling directly from jokaydiaGRID to VWERGrid being unable to see or access the region VWERELI. The glitches are being worked out and should be resolved soon. And so ends another meeting of the Hypergrid Adventurers Club. Until next time! This entry was posted in Announcements, Education, Hypergrid Adventurers Club, OpenSim, Virtual Worlds and tagged avatars, education, HyperGate, HyperGrid, Hypergrid Adventurers Club, jokaydiagrid, metaverse, online communities, OpenSim, pioneers, ReactionGrid, second life, virtual worlds, virtual worlds education roundtable, vwer by John "Pathfinder" Lester. Bookmark the permalink.